A crucial attribute that distinguishes the psychiatrist from other medical specialists is a sophisticated, trained understanding of the psychological forces, deficits and conflicts at work in the individual patient. These elements, which reflect the psychological makeup and personality of the patient, manifest themselves in all contexts, from mild adjustment disorders to psychotic illnesses, trauma, loss and so on. Learning and practicing psychodynamic psychotherapy is the key experience that develops this psychological awareness in the trainee. Extensive clinical experience in this area consolidates the psychiatrist's identity and effectiveness and has applications in all branches of psychiatry, no matter what the resident's final subspecialization may be. This component of our training program is unique in that a model of psychotherapy incorporating the four major theoretical dynamic orientations of drive, ego, object and self, anchored in a perspective derived from developmental psychology, forms the basis of teaching. Since it has become increasingly evident that no single school of psychodynamics can meet the therapeutic needs of all patients, the essence of this model is the integration of the disparate psychodynamic theories in the clinical setting. This enables trainees to understand the nature of psychopathology from both the conflict and deficit viewpoints and allows them to apply this developmental model to the differential treatment of patients. Considerable supervisory emphasis is given to psychodynamically informed clinical diagnostic interviewing, which marks the first phase of learning psychotherapy. An understanding of the clinical importance of the psychodynamic formulation from the viewpoint of the aforementioned integrated conceptual models is emphasized, showing their predictive value in the unfolding treatment of the patient. Didactic seminars during this year review basic psychodynamic concepts and examine fundamental principles, such as transference, countertransference, ego defenses and resistance, as they occur in the clinical situation. The long-term, inpatient treatment unit provides a unique venue for the application of psychodynamic psychotherapy principles to treating the more dysfunctional patient. Because of the grave psychopathology in this patient population, vivid demonstrations of unconscious phenomena and disturbances in ego functions can be seen. Weekly psychodynamically oriented supervision of the residents' psychotherapeutic treatment of these patients is a key element of PGY 2. The central clinical experience focuses on conducting intensive long-term psychotherapy with higher-functioning patients. 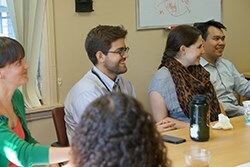 Because a psychotherapy institute, which provides mental health services for medical students, graduate students and hospital professional staff, is housed in our outpatient department, all residents are able to have extensive experience in treating higher-functioning patients. Didactic seminars during these years include the practice of psychodynamic psychotherapy, fundamentals of psychoanalytic theory, and post-Freudian developments. Individual supervision of residents is provided by psychoanalysts affiliated with the major psychoanalytic institutes in New York City. For residents wishing to subspecialize, additional elective clinical and supervisory experiences are available.